Our products are packed with healthy ingredients. Top quality fresh vegetables account for nearly a quarter of their weight; all except the Vegan nutroast contain local free-range eggs and vegetarian cheese is used in the Luxury, the Mediterranean and the Traditional. The nutritional value of some of our other main ingredients is less well-known. This page gives details on the health benefits of Brazil nuts, cashew nuts, hazelnuts and peanuts, plus the “superfoods” cranberries and quinoa, and gram (chickpea) flour, which we use in all our nutroasts. Like most other nuts, Brazil nuts contain heart-healthy monounsaturated fats that can benefit cholesterol levels. However, what really makes them special is their high selenium content. Although not strictly speaking an antioxidant, selenium is an essential component of two important antioxidant enzymes, glutathione peroxidise and glutathione. Selenium also works together with vitamin E, one of the important network antioxidants. Brazil nuts' health benefits include helping to protect against heart disease, cancer and thyroid problems. Other good sources of selenium include garlic and onions, wheat germ and egg yolks, all ingredients in Thank Goodness nutroasts. Cashew nuts are rich in copper, which is an indispensable constituent of many complex proteins and plays an important role in a variety of physical processes such as iron usage, destruction of free radicals and the development of healthy bone and connective tissue. Copper also improves the malleability in blood vessels, bones and joints and is essential in producing an important skin and hair pigment known as melanin. Cashew nuts also possess substantial amounts of antioxidants that shield the body from carcinogens and heart disease. Moreover since they also contain high levels of monounsaturated fatty acids, they are useful in supporting good (HDL) cholesterol. According to a recent study, the consumption of cashew nuts was shown to reduce the risk of gallstone disease. Some dental experts also hold the opinion that consuming a moderate amount of cashew nuts on a daily basis can get rid of abscesses in the teeth, although these claims have yet to be proven by medical clinical studies. With approximately five grams of protein per ounce, cashew nuts are a healthy treat for physically active individuals and athletes. However, since cashew nuts are also high in essential minerals like iron, magnesium, copper, zinc, and phosphorus, they make an excellent choice for adults and children alike. Cashew nut benefits include their ability to satisfy high-density energy needs and provide essential dietary fibre. 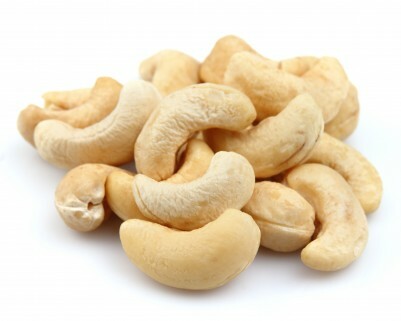 Like most nuts, cashew nuts also contain fats and high fatty acid content. However, most experts agree that fat from the cashews is actually ‘good fat’, so long as it is consumed in moderation. Weight watchers may actually benefit from eating cashew nuts as studies show that eating a handful of nuts twice a week may lower the risk of weight gain. The proanthocyanidins in cranberries can inhibit bacteria from attaching to the wall of the urinary tract. This limits their ability to produce colonies and spread infection. So it's a good idea to drink lots of cranberry juice if you are prone to urinary tract ailments. Because they contain flavonoids, studies suggest that cranberries can be a weapon in the war against atherosclerosis, or what they used to call "hardening of the arteries". Flavonoids help reduce the amount of bad cholesterol clogging the walls of your arteries while increasing the level of good cholesterol in your system. Research at the University of Western Ontario cites increased ingestion of cranberries as a factor in inhibiting the development of breast cancer cells in animals. Although preliminary, this exciting research shows that diet changes can have an impact on our health and aid in fight disease. The good news doesn't stop there. Cranberries have also been associated with decreased production of cavity and plaque producing bacteria in your mouth, and in reducing the bacteria associated with peptic stomach ulcers. Gram flour, which we now use in all our nutroasts, is made from chickpeas. Being high in both soluble and insoluble fibre and with a low glycaemic index, chickpeas can help you to feel fuller for longer, thereby helping to control appetite and manage weight. Eaten regularly they can also help to reduce the risk of chronic diseases such as obesity, diabetes, heart disease and certain cancers. They also contain fructo-oligosaccharides, a type of prebiotic carbohydrate fibre, which supports healthy gut flora. Maintaining a healthy balance of friendly bacteria in the colon is necessary to optimize digestive function and strengthen immunity. An excellent low-fat source of protein, chickpeas are rich in the essential amino acid lysine (which is vital for many body functions including growth, tissue repair, maintenance of muscle mass and the production of hormones, enzymes and antibodies), but lacking in others such as methionine and tryptophan. To improve overall protein quality (which is especially important in vegan and vegetarian diets) dieticians recommend that you eat chickpeas in combination with grains, nuts, seeds, soya or Quorn products – like the bread and nuts in a Thank Goodness nutroast! Here are four reasons to take a fresh look at hazelnuts. While some types of fats aren’t heart healthy, hazelnuts are an excellent source of polyunsaturated and monounsaturated fats that help to protect heart health. Hazelnuts are known for their high concentration of oleic acid, the same type of “good” fat that gives olive oil its beneficial properties. Oleic acid has been shown to lower levels of LDL (the bad cholesterol) and raise HDL’s (the good cholesterol). This makes these tasty nuts a heart-healthy, satisfying choice for snacking. Snacking on hazelnuts fortifies the body with a variety of phytochemicals including proanthocyanidins, quercetin, and kaempherol. The proanthocyanidins are the same flavonoids that give green tea and red wine their health benefits. Proanthocyanidins have shown the potential to protect brain health, improve circulation, and even relieve allergy symptoms. Hazelnuts are one more way to get these powerful benefits. A cup of chopped hazelnuts has a whopping seventeen grams of protein and eleven grams of fiber. They’re a good alternate protein source for those who don’t eat meat, although other forms of vegetarian protein are needed to provide a complete source of essential amino acids. Hazelnuts are an excellent source of vitamin E as well as the B vitamins including folate. They’re also a good source of potassium, calcium, and magnesium which help to maintain a healthy blood pressure. Peanuts, along with beans and peas, are members of the legume family which are the best sources of protein in the plant kingdom, but with peanut allergies on the rise, more and more people are steering clear of these nuts altogether. There’s no arguing that peanut allergies can be extremely serious, and if you are allergic, you should certainly stay away from them. But if you’re not, you may want to take a second look at peanuts. They’re a great source of protein. And they’re also extraordinarily high in polyphenols — the Arnold Schwarzenegger of the antioxidant family. Yes, peanuts are high in fat. But now we know that, like avocados, they are high in the “good” kind — monounsaturated fat. They also contain magnesium, folate, vitamin E, copper, arginine, and fiber — all of which are known to lower risk of cardiovascular disease. Another one of peanuts’ virtues is that they contain high amounts of resveratrol. Studies have shown that resveratrol can inhibit the growth of colorectal tumor cells. Since the other primary source for this compound is red wine, it’s a challenge for people who don’t drink alcohol to get enough: peanuts to the rescue! A grain-like seed, from Latin America, quinoa is rich in protein content. In fact, it is a complete protein as it contains all the essential amino acids, especially lysine, which is required by the body to grow and repair tissues. * It also has a high proportion of manganese in it, which acts as an antioxidant in the body and helps it get rid of dangerous cancer cells and other diseases. * It is a good source of magnesium, which provides relief from migraine headaches, relaxes blood vessels, and decreases the risk of hypertension. * Riboflavin present in quinoa also reduces the frequency of migraine attacks. * Potassium and magnesium help to prevent clogging of arteries and hence to relieve stress on the heart. * Quinoa has a low proportion of saturated fats and cholesterol, making it an ideal food for every health-conscious consumer. * It is a good source of calcium, which is extremely important for the growth of healthy teeth, bones and skin. * It is a boon for people who are allergic to wheat and are suffering from Celiac disease, as it is gluten free. * Quinoa is a wonderful source of fibre, which aids easy elimination and toning of the colon. * It is a good source of insoluble fibre that helps avoid gallstones, especially in women who are more prone to them. * The high content of copper present in it helps in oxidizing glucose, produces the skin colouring agent melanin and acts as a catalyst in the formation of haemoglobin. * Quinoa is rich in carbohydrates, an efficient fuel for energy production required by children and athletes.